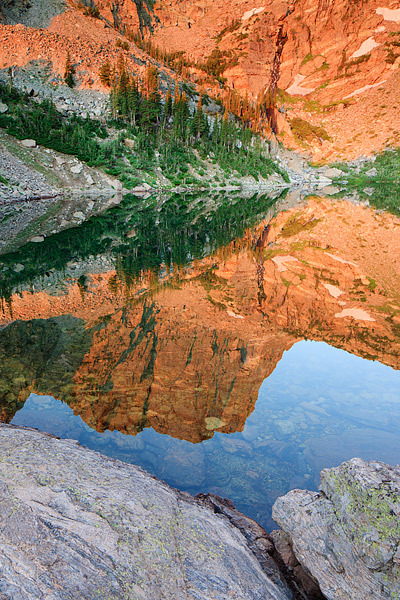 The hike from the Bear Lake trailhead to the famous trifecta of lakes above Bear Lake is a favorite amongst visitors to Rocky Mountain National Park. Nymph Lake, Dream Lake and Emerald Lake grace postcards found in gift shops all around the park for good reason. Emerald Lake is the farthest of the 3 lakes at 1.8 miles from the parking lot but one of the most spectacular. Hallet Peak and Flattop Mountain rise dramatically above Emerald Lake creating a classic Colorado alpine scene. Photo © copyright by Thomas Mangan.